Minneapolis is the largest settlement in the U.S. state of Minnesota. Minneapolis is located in the southern states. The city lies on the banks of the Mississippi River and adjacent is the second largest city and capital of the state - St. Paul. The two cities together form a conurbation known by the name Twin Cities. The agglomeration of Minneapolis and St. Paul is the 15th largest in the country and in the world it occupies 65th position, based on size. It is estimated that if the two cities come together, the resulting "city" will be ranked 17th in the United States in size. The agglomeration Minneapolis - St. Paul will fall between the cities of Louisville, Kentucky and Austin, Texas. Currently in Minneapolis are about 400 000 people. With this population the largest settlement in the U.S. state of Minnesota ranks 47th in population density of people in the U.S. We can definitely say that the townspeople were lucky. Minneapolis is extremely beautiful. It is also called "city of lakes" because it has 24 lakes within its scope. Besides those waters Minneapolis is rich with numerous streams, water sleeves of the Mississippi River and various waterfalls. Along with some of them have been formed beautiful parks, which are among the most peaceful and pleasant places in the American city. The agglomeration Minneapolis - St. Paul was named one of "the smartest cities in America", according to an online magazine. It said that its achievement is due to the fact that many citizens have bachelor degree and above, and the fact that voters here have high turnout. 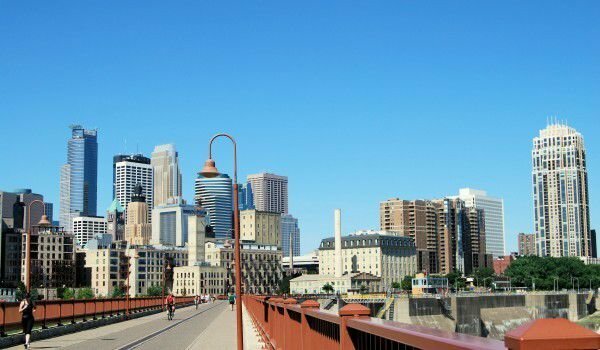 Another comes from a recognition rating, which ranked Minneapolis among the top positions of the best cities in the U.S. Minneapolis takes the prestigious eighth place, leaving behind their other 92 major U.S. cities. Reasons for the top position are the high economic growth, educational opportunities and options for year-round recreation and entertainment that Minneapolis offers. Minneapolis has one of the world's best centers with regards to cycling. The very infrastructure of the city is constructed to promote cycling as a way of life, as a professional sport or simply as a means of recreation and relaxation. Minneapolis developed a serious policy direction to promote cycling as a viable means of transportation. Within the city streets are built 43 kilometers of bike lanes, but apart from that there are special 83 miles of trails for biking. Cultural attractions in Minneapolis are endless. Suffice it to mention that Minneapolis ranks second only to New York in number of theaters per capita. Minneapolis as a whole is the third largest theater market in the U.S., after New York and Chicago. The alternative to Broadway in the town is Guthrie Theater. Since the beginning of last century Minneapolis has a jazz tradition, and today there are restaurants everywhere with live music. Countless galleries and museums can be visited in Minneapolis - Katherine Nash Gallery, the Museum of Russian Art, Walker Art Center and many others.